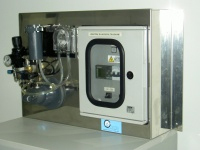 The analyzer is delivered only after a long and successful series of final tests. It is ready for installation, without any further adjustment, and is complete of a spares set for start up. To start monitoring is enough to connect sample line, waste line and power supply. As a result of years of intensive research and development activities, EASYCHEM TOX Early Warning is an original direct reading on-line analyzer based on discrete analysis technology, for fully automated toxicity measurements of water samples using live cultures of luminescent bacteria. EASYCHEM on-line is a discrete automated platform equipped with color touchscreen LCD and housed in an industrial cabinet, comprising two refrigerated compartments, one for bacteria (TOX version) and the other for reagents, calibrants and controls. A mechanical arm for aspiration, transferring and dispensing of reagents and samples and a thermostated reaction plate with 80 positions are incorporated with a luminometer, a spectrophotometer and/or a fluorometer, integrated with an automated cuvette washing station.